Before I jog, I warm up by stretching. Before I begin my writing day, I often warm up by completing a writing prompt. For a year or so I posted a prompt a day on Google+. I loved reading the responses folks shared as much as I enjoyed crafting my own. You go for a hike and become irrevocably lost. It's twilight. 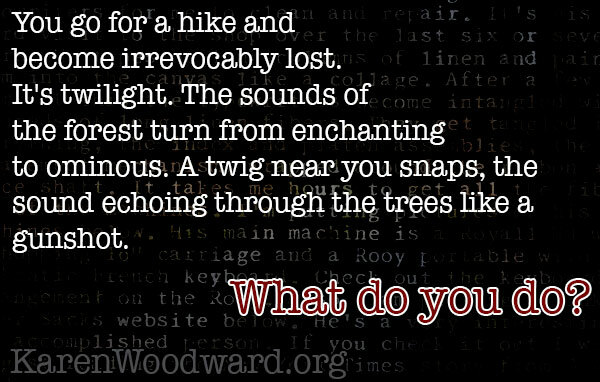 The sounds of the forest turn from enchanting to ominous. A twig near you snaps, the sound echoing through the trees like a gunshot.